I love a good scary movie and with Insidious, director James Wan and writer Leigh Whannell ditched the blood, torture and gore to bring us back to the basic joys of shocks and suspense. Renai (Rose Byrne) and Josh (Patrick Wilson) Lambert are a couple who have recently moved into a beautiful old house with their three children. Within the first couple of days their son Dalton (Ty Simpkins) suffers a simple fall and suddenly lapses into a coma. Months have pasted and still the doctors cannot explain why or how this happened. It's during this time that Renai feels uneasy about their living situation - she begins to feel an evil presence within the house. And from there the story unfolds. The first half of the movie is completely terrifying. Wan does an excellent job building up thick tension to create uneasy shocks and scares. I was so afraid of what was going to happen next. The second half of the movie, however, turned completely campy with weirdness and off the wall silliness. The film went from super scary to more of a fun scare-fest. 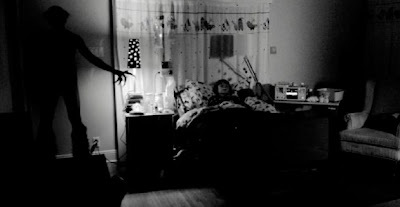 Sure it was still eerie, but it wasn't nearly as horrifying in the end as you would think from watching the trailer. I was a little disappointed by that, and yet relieved at the same time. 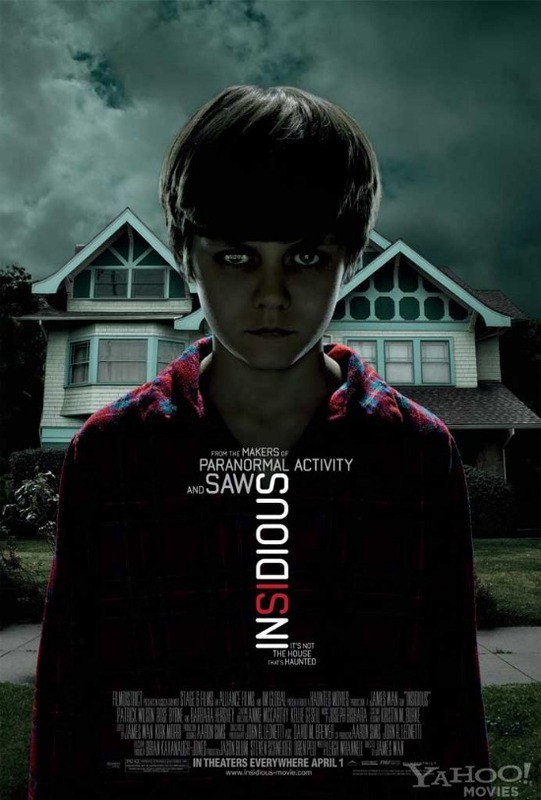 Over all Insidious was a pretty-good genre flick and probably one of the best old-fashioned genre films in a long time (reminiscent of Poltergeist). I enjoyed the subtle throwbacks to Sam Raimi. Alternately spooky and scary this horror flick also g oes dizzily over the top for its thrills. Unlike the spine-chilling antics of Paranormal Activicty, spirits and demons get actual face time here, and their eccentricity comes with unsettling humor that never fails to give you the creeps. It's a fun, campy, and at times extremely horrifying joy ride with a stinger of an ending. Did you know? The film's composer Joseph Bishara did double duty on the movie, creating the film’s score and appearing on screen as a memorable red-faced demon. Not only was the music fun and super creepy (reminiscent of the old 80's horror flicks), but he looked absolutely horrifying. I swear I almost took a crap in my pants from the trailer (ALONE). I might as well expect trauma and trouble sleeping after I watch the movie. Thanks for the review. The Most Famous Movie Scream Ever!